Conference Organizers: International Auto/Biography Association of the Americas IABAA (co-convened by Eva C. Karpinski and Ricia Chansky) and the Centre for Feminist Research at York University, in collaboration with the School of Gender, Sexuality, and Women's Studies, the Department of Humanities, and the Graduate Program in Critical Disability Studies at York University, the international journal a/b: Auto/Biography Studies, and the Fulbright Specialist Program. “Lives Outside the Lines: Gender and Genre in the Americas,” held from May 15-17, 2017 at York University in Toronto, was the third biennial conference of the International Auto/Biography Association Chapter of the Americas (IABAA). The conference brought together the leading scholars of autobiography, biography, and other forms of life writing, as well as new and emerging scholars, artists and practitioners of life writing, and graduate students. Focusing on regional and hemispheric research and scholarship, the conference explored the multiple lines that gendered lives in the Americas cross, both physical boundaries of national borders and intangible crossings of the established borders of gender, language, and genre. The themes of "Lives Outside the Lines" were directly linked to the importance of transnational movements triggered by globalization and the popularity of multi-media and multi-genre experimentation that creates new possibilities and forms of self-representation. Papers and presentations delivered at this conference investigated diverse representations and intersectional theorizations of embodiment and identity, with special attention given to marginalized lives, excluded subjects, traumatic histories, and invisible narratives. 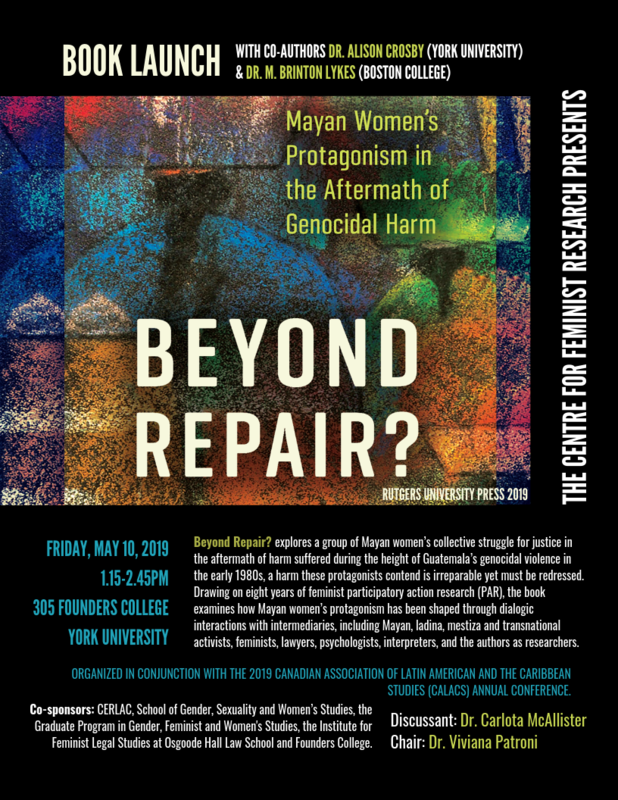 The event was dedicated to the celebration of the scholarship of York professor and CFR Associate Marlene Kadar, a theorist and critic whose contributions have dramatically altered the field and expanded its interdisciplinary methods of study. IABAA has been at the forefront of research that shapes the global scholarly dialogue on life narratives in Canadian, African American, Latin American, Caribbean, and African diasporic literatures, deepening cross-cultural understandings of diversities of self, identity, and experience. Its conferences promote transnational investigation, collaboration, and study, especially in areas related to colonialism, postcolonialism, decolonialism, racialization, diaspora, Indigeneity, and gender and sexuality constructions across the Americas. This conference reflected the interdisciplinary and multi-generational composition of the participating group of scholars from the North and South, fostering networking and innovation in the field; facilitating new collaborations and publications; and training and integrating graduate students into the international academic community. Since almost all major Canadian scholars of life writing were in attendance, the conference showcased the high position that the Canadian school of auto/biography and life writing studies occupies in the global field. The three-day conference “Lives Outside the Lines” consisted of a half-day mentoring workshop for graduate students, co-organized by the SNS Network (Life Writing Graduate Student and New Scholar Network affiliated with IABA); one-and-a-half days of simultaneous panels drawn from an open Call for Papers; and one full day of single panels by invited speakers. Other activities included a book launch of Auto/Biography in the Americas: Relational Lives (Routledge 2016), with substantial contributions by Canadian scholars and a student-curated community and activist art exhibit. Expected outcomes include a special issue of a/b: Auto/Biography Studies (forthcoming 2018), an edited collection, and an open access online archive in York Space.